The definition of “ombre” is having colors or tones that shade into each other, especially from light to dark. 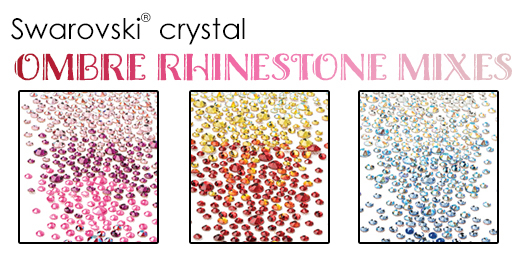 HarMan is taking that definition and bringing it to life in Swarovski crystal Rhinestones with our new and exclusive Ombre Rhinestone Mixes . Ombre as a design technique has become very trendy over the past few years, especially in costume design, nail art, and fashion apparel. Designers talk to us all the time about how they want to do an ombre design on shoes or a shirt, but making an ombre design look really good, is really hard. What colors to use? What size rhinestones? We took all the hard work out and made creating an ombre design really easy! Swarovski recently inspired us, with their inspirational ombre newsletter which featured three beautiful ombre designs using Swarovski crystal Rhinestones. 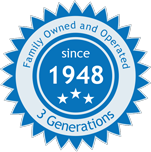 These Ombre designs highlight three color families: Pink, Blue and Yellow/Orange. We took it a step further and created do-it-yourself kits for you to easily replicate these ombre designs. The “Pretty In Pink” Ombre Collection features 720 pieces (5 gross) of Swarovski 2058 and 2088 Rhinestones in sizes SS9, SS12, SS16, SS20 and SS30. It includes the following colors, listed from dark to light: Light Siam Shimmer, Crystal Peony Pink, Fuchsia, Light Rose, and Light Rose AB. The “Frosted” Ombre Collection features 720 pieces (5 gross) of Swarovski 2058 and 2088 Rhinestones in sizes SS9, SS12, SS16, SS20 and SS30. It includes the following colors, listed from dark to light: Crystal Royal Blue, Light Sapphire, Light Sapphire Shimmer, Crystal Shimmer and Crystal. The “Fire” Ombre Collection features 720 pieces (5 gross) of Swarovski 2058 and 2088 Rhinestones in sizes SS9, SS12, SS16, SS20 and SS30. It includes the following colors, listed from dark to light: Siam, Light Siam, Fire Opal, Light Topaz, and Citrine Shimmer. These Ombre Rhinestone Collections are exclusive to HarMan and only sold on www.harmanbeads.com! So, start making your ombre designs today with our new Ombre Swarovski Rhinestone Mixes. And be sure to visit www.harmanbeads.com/swarovski-crystals to see our full offering of Swarovski crystals and www.harmanbeads.com/swarovski-rhinestone-mixes for all of our exclusive Swarovski Rhinestone mixes.